Now that I’ve been using the iPad Air for 2 weeks now, I thought it’d be nice to see how it has changed my life in regard to how much stuff I carry around with me each and every day. 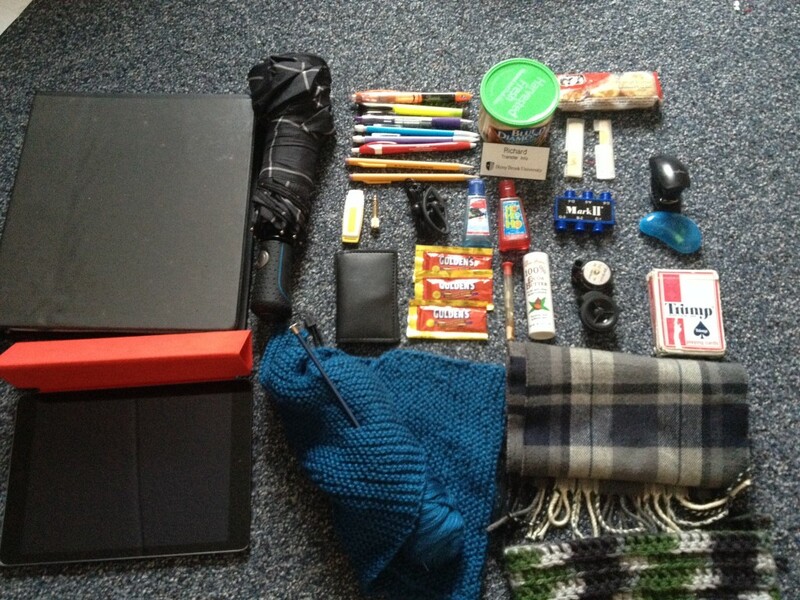 So, without further ado…What’s In My Bag?? Water bottle (It was being washed at the time. I go through about 80-100 ounces of water a day). I recently swapped my bags out. For four years I used a messenger bag that was my go to bag for everything (school, travel, storage, you name it..). Last semester I purchased a true backpack because I figured the two straps would be better for my terrible back. This bag is smaller so I have had to minimize what I have. I used to also keep band-aids, ibuprofen, other OTC meds, and my flute/piccolo. Now I have a separate music bag. At my last school, my friends joked that I was the “dad” of the group. My best friend was known as the “mom.” Between the two of us we would have whatever was needed. I’ve gone through sewing kits (which is now stored in my flute travel bag), trumpet and baritone mouthpieces (once again…I play the flute), more general office supplies, napkins, a rubber duck, air freshener, and hand wipes. I am proud to have my bag down to only this much stuff…but it sometimes makes me panic because I don’t have something! For most of what is currently in my bag, the iPad cannot replace. I bought a Nexus 7 last year so I had already begun the “deforestation” of my own clutter. Paradoxical pun definitely intended. It can, however, replace my class readings and notes. I have begun to take notes on Google Docs and quite enjoy it, but the professor gives us handouts as well. Also, when reading lots of difficult articles, I like to use my own system of highlighting and whatnot. This also allows for my hole-puncher and stapler to be used. I know that I can do this electronically, but haven’t had the time to figure out how to do what I like to do just yet. Through the cloud, my flash drive can also be replaced (unless going to one of the last remaining no-fi zones). I believe that I have already done a decent job of letting the iPad replace my note-taking and most of my class readings. Other than that, these things cannot be replaced. At the end of the day, I simply need a pencil (to write on sheet music), my name tag for work, and the warmth from my scarf and headband (this is New York, after all). I just like having lots of stuff. The craziest thing I probably have at first glance, are the 2 “tweeters,” but in the end, I think the clarinet and saxophone reeds are the most out-of-the-ordinary since I play the flute. And then there’s Duckter Donna. 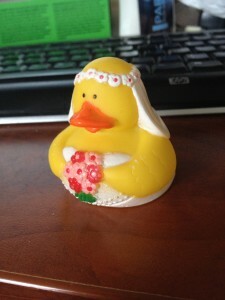 But who doesn’t have a rubber duck-bride named after a Doctor Who storyline? Doctor DonnaDoctor WhoMusic MajorSpring 2015Weekly iPad ReflectionWhat's in My Bag? Ken’s iPad Reflection, Week 2: What’s in My Bag? I love that you carry around packets of mustard in your bag. That’s too funny! You never know when you will be in a time of need! I had actually planned on using them during a lunch, but changed my mind on what to eat. Mustard is my favorite condiment. Good choice. Playing cards… do you know any magic tricks? I know some magicians always carry around cards just in case they have an opportunity to entertain. Yes, clarinet reeds! I used to be a music education major at my previous school. I’ve also run a lot of beginning band woodwind clinics. You would be surprised at how often I’ve been asked if I could help out a wind section—gotta always be prepared! Unfortunately I’m not a magician. J.K. Rowling still hasn’t gotten back to me about the status of my Hogwarts letter. I think it’s a few years late! I like the mini stapler. I think that I may put one in my bag!